The Kanex Pro HDMI Repeater With 3D Support - 10.2 Gbps All Channel provides a one-stop solution for extending an HDMI cable up to 115' (35 m) through regeneration and signal equalization. This 3D-compatible repeater has HDCP and EDID support and is capable of outputting full HD 1080p/60 to your projector or monitor, while eliminating digital noise from the video signal and maintaining the best possible picture quality. This repeater can be used for routing or extending sources like Blu-ray players or DVRs to remotely located projectors or other displays. Box Dimensions (LxWxH) 6.7 x 5.0 x 2.4"
HDMI Repeater With 3D Support - 10.2 Gbps All Channel is rated 4.8 out of 5 by 5. Rated 5 out of 5 by Onomontopeka from Extends my HDMI for ATEM TVS It works to extend my HDMI cable to about 40 feet. I'm sending the signal to a Blackmagic ATEM TV Studio and it works! Didn't even need to use the power adapter. Rated 5 out of 5 by < from Works perfectly I've got it connected like this: From various Mac and Dell laptops to a 30' Blue Jean Series 1 HDMI cable, then to the Repeater, then to another 30' Blue Jean Series 1 HDMI cable, and to a projector. Worked first time, works every time! Thanks, B&H! Rated 5 out of 5 by gary_vineyard from Works great so far So far, so good. I am running two 25 footers from an Camcorder to the Blackmagic TV production switcher. I know it is not orthodox, but it works for what I need it for...a long HDMI run without latency. Rated 5 out of 5 by Ruben from Very good product Works great i use it with a 65ft long cable. I personally use it with the power supply, but it works just fine without too. Will this send the output from my cable box to the Kanex receiver and connect to another TV to watch in another room? Yes. this device will send the signal via HDMI from the cable box to the TV. This wired repeater doesn't operate at any frequency, other than the standard AC electrical 50/60Hz. The amp bandwidth is 3.4Gbps/340MHz. I have 40' out from my MAC connected to a 4 way splitter and 2 30' from splitter to projectors and 1 12' to a TV where should I connect this booster for better signal? Close to the source, but before the splitter. what is the recommended max cable length on the output side? does this support ARC (auto return channel)? Does this repeater transmit both video and audio? It will transmit both video and audio. Why didn't it come with instructions? Also why doesn't it work? HDMI is supposed to provide power to operate devices such as in line repeaters, boosters, etc. But Not every HDMI device powers the cable. For example, automatic HDMI switches mostly do not send power down the cable. 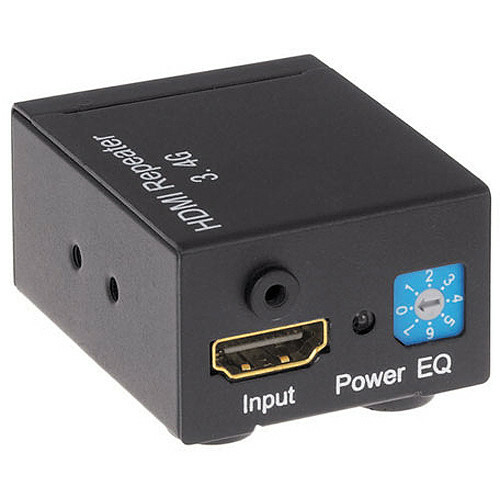 In those instances you have to use an HDMI power inserter at the near end to provide power for an HDMI repeater at the far end (at the projector). Should this be placed in line near the source (camera) or near the monitor (LCD screen)?